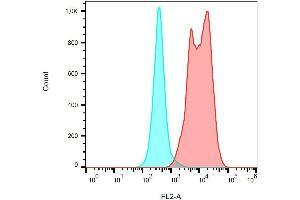 Surface staining of PMA/ionomycin-activated PBMC using anti-CD154 (24-31) PE. Specificity The mouse monoclonal antibody 24-31 detects CD154 / CD40L (CD40-ligand), a 39 kDa cell surface type II glycoprotein expressed predominantly on activated CD4+ lymphocytes. Background CD154 / CD40L (CD40 ligand) is a member of the tumor necrosis factor family, and is expressed primarily on activated CD4+ lymphocytes, but also on mast cells, basophils, eosinophils and human dendritic cells. Its counter-receptor CD40 is expressed on antigen presenting cells, including dendritic cells, macrophages, and B cells, and also on fibroblasts. Triggering of CD40 by CD40L causes maturation of dendritic cells and upregulation of antigen presentation in functions of the MHC and costimulatory molecules. CD40L also functions as a direct stimulating factor for T cells. CD40L plays also roles e.g. in antibody class switching and modulation of apoptosis in the germinal center. Application Notes The reagent is designed for Flow Cytometry analysis of human blood cells using 10 μ,l reagent / 100 μ,l of whole blood or 106 cells in a suspension.The content of a vial (1 ml) is sufficient for 100 tests. The purified antibody is conjugated with R-Phycoerythrin (PE) under optimum conditions. The conjugate is purified by size-exclusion chromatography and adjusted for direct use. No reconstitution is necessary. Buffer The reagent is provided in stabilizing phosphate buffered saline (PBS) solution containing 15 mM sodium azide. Storage Comment Store in the dark at 2-8°C. Do not freeze. Avoid prolonged exposure to light. Do not use after expiration date stamped on vial label.